Looking for a quiet spot to hike or fish? The Leita Thompson Memorial Park in Roswell, Georgia is the perfect place. Located near the border between Roswell and Woodstock, this park offers winding wooded trails, a secluded fishing pond, dog run area, benches, free Wi-Fi, a visual arts center, and several walking paths. 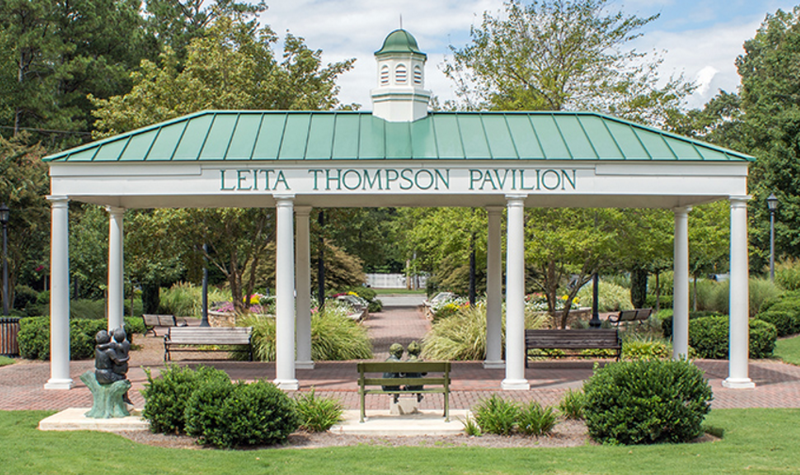 From Woodstock Road, also known as Highway 92, you can see the Leita Thompson Memorial Pavilion, sculptures, rose garden, and fountain, but that’s just the beginning of the awesome park. Despite being situated right off of Woodstock Road, once you get into the wooded trail areas you can’t hear the cars, and it can feel like you’re somewhere in the North Georgia mountains. There are many reasons why this is one of the best parks in Roswell, and one of them is because of the beautiful nature trails. The trails are covered in gravel and offer a variety of scenery, including forest areas, fields, and the fishing pond. The trails wind over and between wooded hills, and offer a challenging but enjoyable walk or run. The dog park feature an off-leash, fenced-in area with sections for both large and small dogs, and the trails are also great for taking a walk with your four-legged friend! The located at 1200 Woodstock Road in Roswell, Leita Thompson Memorial Park is definitely one of the top parks in Roswell!